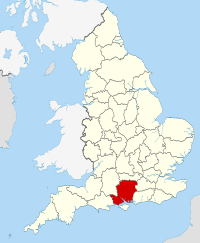 Hampshire (/ˈhæmpʃər/, i/ˈhæmpʃɪər/; abbreviated Hants (in the 17th century and even later known as Hantshire), archaically known as the County of Southampton) is a county on the southern coast of England in the United Kingdom. The county town of Hampshire is Winchester, the former capital city of England. Hampshire is the most populous ceremonial county in the United Kingdom (excluding the metropolitan counties) with almost half of the county's population living within the South Hampshire conurbation which includes the cities of Southampton and Portsmouth. The larger South Hampshire metropolitan area has a population of 1,547,000. Hampshire is notable for housing the birthplaces of the Royal Navy, British Army, and Royal Air Force. It is bordered by Dorset to the west, Wiltshire to the north-west, Berkshire to the north, Surrey to the north-east, and West Sussex to the east. The southern boundary is the coastline of the English Channel and the Solent, facing the Isle of Wight. Hampshire is the largest county in South East England and remains the third largest shire county in the United Kingdom despite losing more land than any other English county in all contemporary boundary changes. At its greatest size in 1890, Hampshire was the fifth largest county in England. It now has an overall area of 3,700 square kilometres (1,400 sq mi), and measures about 86 kilometres (53 mi) east–west and 76 kilometres (47 mi) north–south. Hampshire's tourist attractions include many seaside resorts and two national parks: the New Forest and the South Downs (together covering some 45% of the county). Hampshire has a long maritime history and two of Europe's largest ports, Portsmouth and Southampton, lie on its coast. The county is famed as home of writers Jane Austen and Charles Dickens, as well as the birthplace of engineer Isambard Kingdom Brunel. Hampshire takes its name from the settlement that is now the city of Southampton. Southampton was known in Old English as Hamtun, roughly meaning "village-town", so its surrounding area or scīr became known as Hamtunscīr. The old name was recorded in the Domesday book as Hantescire, and it is from this spelling that the modern abbreviation "Hants" derives. From 1889 until 1959, the administrative county was named the County of Southampton and has also been known as Southamptonshire. The region is believed to have been continuously occupied since the end of the last Ice Age about 12,000 BCE. At this time Britain was still attached to the European continent and was predominantly covered with deciduous woodland. The first inhabitants came overland from Europe; these were anatomically and behaviourally modern humans, Mesolithic hunter-gatherers. Over several thousand years, the climate got progressively warmer, and sea levels rose; the English Channel, which started out as a river, was a major inlet by 8000 BCE, although Britain was still connected to Europe by a land bridge across the North Sea until 6500 BCE. Notable sites from this period include Bouldnor Cliff. Agriculture had arrived in southern Britain by 4000 BCE, and with it a neolithic culture. Some deforestation took place at that time, although it was during the Bronze Age, beginning in 2200 BCE, that this became more widespread and systematic. Hampshire has few monuments to show from these early periods, although nearby Stonehenge was built in several phases at some time between 3100 BCE and 2200 BCE. In the very late Bronze Age, fortified hilltop settlements known as hillforts began to appear in large numbers in many parts of Britain including Hampshire, and these became more and more important in the early and middle Iron Age; many of these are still visible in the landscape today and can be visited, notably Danebury Rings, the subject of a major study by archaeologist Barry Cunliffe. It is maintained that by this period the people of Britain predominantly spoke a Celtic language, and their culture shared much in common with the Celts described by classical writers. Hillforts largely declined in importance in the second half of the second century BCE, with many being abandoned. It was probably around this period that the first recorded invasion of Britain took place, as southern Britain was largely conquered by warrior-elites from Belgic tribes of northeastern Gaul - whether these two events are linked to the decline of hillforts is unknown. By the Roman conquest, the oppidum at Venta, modern-day Winchester, was the de facto regional administrative centre; Winchester was however of secondary importance to the Roman-style town of Calleva, modern Silchester, built further north by a dominant Belgic polity known as the Atrebates in the 50s BCE. Julius Caesar invaded southeastern England briefly in 55 and again in 54 BCE, but he never reached Hampshire. Notable sites from this period include Hengistbury Head (now technically in Dorset), which was a major port. There is a "Museum of the Iron Age" in Andover. The Romans invaded Britain again in 43 CE, and Hampshire was incorporated into the Roman province of Britannia very quickly. It is generally believed their political leaders allowed themselves to be incorporated peacefully. Venta became the capital of the administrative polity of the Belgae, which included most of Hampshire and Wiltshire and reached as far as Bath. It is not recorded whether the people of Hampshire played any role in Boudicca's rebellion of 60-61 CE, but there is evidence of burning in Winchester dated to around this period. For most of the next three centuries, southern Britain enjoyed relative peace. The later part of the Roman period saw most towns build defensive walls; a pottery industry based in the New Forest was exported widely across southern Britain. There was a fortification near Southampton called Clausentum, part of the Saxon Shore forts, traditionally seen as defences against maritime raids by Germanic tribes. The Romans officially withdrew from Britain in 410 CE. Records are unreliable for the next two hundred years, but in this time southern Britain went from being Brythonic to being English and Hampshire emerged as the centre of what was to become the most powerful kingdom in Britain, the Kingdom of Wessex. Evidence of early Anglo-Saxon settlement has been found at Clausentum and on the Thames at Dorchester, dated to the fifth century, and by the seventh century, the population of Hampshire was predominantly English-speaking. It is also around this period that the administrative region of "Hampshire" seems to appear; the name is attested as "Hamtunscir" in 755, and Albany Major suggested that the traditional western and northern borders of Hampshire may even go back to the very earliest conquests of Cerdic, legendary founder of Wessex, at the very beginning of the sixth century. Wessex gradually expanded westwards into Brythonic Dorset and Somerset in the seventh century. A statue in Winchester celebrates the powerful King Alfred, who repulsed the Vikings and stabilised the region in the 9th century. He was also a great scholar, who commissioned the Anglo-Saxon Chronicle, a powerful tool in the development of the English identity. King Alfred proclaimed himself "King of England" in 886; but it was not until 927 that Athelstan of Wessex officially controlled the whole of England. By the Norman conquest, London had overtaken Winchester as the largest city in England, thanks in part to Alfred the Great's investments in infrastructure, and after the Norman Conquest King William I made it his capital. The centre of political power moved away from Hampshire, although Winchester remained a city of importance: it was the proximity of the New Forest to Winchester that made it such a prized royal hunting forest; indeed King William Rufus was famously killed in suspicious circumstances while hunting there. The county was recorded in the Domesday Book divided into 44 hundreds. From the 12th century the ports grew in importance, fuelled by trade with the continent, wool and cloth manufacture in the county, and the fishing industry, and a shipbuilding industry was established. By 1523 at the latest, the population of Southampton had outstripped that of Winchester. Over several centuries a series of castles and forts were constructed along the coast of the Solent to defend the harbours at Southampton and Portsmouth. These include the Roman Portchester Castle which overlooks Portsmouth Harbour, and a series of forts built by Henry VIII including Hurst Castle, situated on a sand spit at the mouth of the Solent, Calshot Castle on another spit at the mouth of Southampton Water, and Netley Castle. 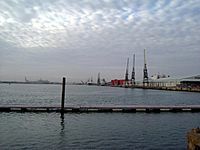 Southampton and Portsmouth remained important harbours when rivals, such as Poole and Bristol declined, as they are amongst the few locations that combine shelter with deep water. Southampton has been host to many famous ships, including the Mayflower and the Titanic, the latter being staffed largely by natives of Southampton. Hampshire played a crucial role in the Second World War due to the large Royal Navy naval base at Portsmouth, the army camp at Aldershot and the military Netley Hospital on Southampton Water, as well as its proximity to the army training ranges on Salisbury Plain and the Isle of Purbeck. Supermarine, the designers of the Spitfire and other military aircraft, were based in Southampton, which led to severe bombing of the city. Aldershot remains one of the British Army's main permanent camps. Farnborough is a major centre for the Aviation industry. Although the Isle of Wight has at times been part of Hampshire, it has been administratively independent for over a century, obtaining a county council of its own in 1890. The Isle of Wight became a full ceremonial county in 1974. Apart from a shared police force there are now no formal administrative links between the Isle of Wight and Hampshire, though many organisations still combine Hampshire and the Isle of Wight. The towns of Bournemouth and Christchurch also fall within the traditional county of Hampshire, but were transferred to Dorset in the local government reorganisation of 1974. The boundary was changed again in 1992, when South Tidworth was transferred to Wiltshire. The City Museum in Winchester covers the Iron Age and Roman periods, the Middle Ages, and the Victorian period over three floors. Hampshire was the departure point of some of those later to settle on the east coast of what since 1776 is the United States, earlier during the 17th century, giving its name in particular to the state of New Hampshire. 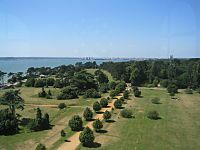 The counties of Isle of Wight and Southampton in Virginia reflect the origins of some of the earliest Jamestown settlers. Portsmouth VA, appropriately enough, is home to one of the US Navy's main dockyards, the Norfolk (formerly Gosport) Naval Yard. At the Census 2001 the ceremonial county recorded a population of 1,644,249, of which 1,240,103 were in the administrative county, 217,445 were in the unitary authority of Southampton, and 186,701 were in Portsmouth. The population of the administrative county grew 5.6% from the 1991 census, Southampton grew 6.2% while Portsmouth remained unchanged, compared with 2.6% for England and Wales as a whole. Eastleigh and Winchester grew fastest at 9% each. 96.73% of residents were white British, falling to 92.37% in Southampton. The significant ethnic minorities are Asian at 1.34% and mixed race at 0.84%. 0.75% of residents were migrants from outside the UK. 73.86% stated their religion as Christianity and 16.86% were not religious. Significant minority religions were Islam (0.76%) and Hinduism (0.33%). The county has a high level of car ownership, with only 15.7% having no access to a private car compared with 26.8% for England and Wales. The county has a lower than average use of trains (3.2% compared with 4.1% for commuting) and buses (3.2% to 7.4%) but a higher than average use of bicycles (3.5% to 2.7%) and cars (63.5% to 55.3%). The table below shows the population change up to the 2011 census, contrasting the previous census. It also shows the proportion of residents in each district reliant upon lowest income and/or joblessness benefits, the national average proportion of which was 4.5% as at August 2012, the year for which latest datasets have been published. It can be seen that the most populous district of Hampshire is New Forest District containing many villages and the towns of Fawley, Hythe and Dibden, Lymington, Lyndhurst, Milford-on-Sea, New Milton, Ringwood and Totton and Eling. Hampshire has wildlife typical of the island of Great Britain. The River Test has a growing number of otters, although other areas of the county have quite low numbers. There are reports of wild boar across the county. The New Forest is known for its ponies, which have free rein over much of the area. One distinguishing feature is that Hampshire has a large free roaming herd of red deer, including more than 6,500 stags during busy seasons. The stag population is managed by the government and hunting is carefully regulated. Hampshire's geology falls into two categories. In the south, along the coast is the "Hampshire Basin", an area of relatively non-resistant Eocene and Oligocene clays and gravels which are protected from sea erosion by the Isle of Purbeck, Dorset, and the Isle of Wight. These low, flat lands support heathland and woodland habitats, a large area of which forms part of the New Forest. The New Forest has a mosaic of heathland, grassland, coniferous and deciduous woodland habitats that host diverse wildlife. The forest is protected as a national park, limiting development and agricultural use to protect the landscape and wildlife. Large areas of the New Forest are open common lands kept as a grassland plagioclimax by grazing animals, including domesticated cattle, pigs and horses, and several wild deer species. Erosion of the weak rock and sea level change flooding the low land has carved several large estuaries and rias, notably the 16 km (9.9 mi) long Southampton Water and the large convoluted Portsmouth Harbour. The Isle of Wight lies off the coast of Hampshire where the non-resistant rock has been eroded away, forming the Solent. In the north and centre of the county the substrate is the rocks of the Chalk Group, which form the Hampshire Downs and the South Downs. These are high hills with steep slopes where they border the clays to the south. The hills dip steeply forming a scarp onto the Thames valley to the north, and dip gently to the south. The highest point in the county is Pilot Hill, which reaches a height of 286 m (938 ft), and lies on the border with West Berkshire. Butser Hill near Petersfield is the second highest point at 271 metres (889 ft) and lies in the South Downs National Park. The highest village in Hampshire at between 235-240m above sea level is Ashmansworth, located between Andover and Newbury. The downland supports a calcareous grassland habitat, important for wild flowers and insects. A large area of the downs is now protected from further agricultural damage by the East Hampshire Area of Outstanding Natural Beauty. The Itchen and Test are trout rivers that flow from the chalk through wooded valleys into Southampton Water. Nestled in a valley on the downs is Selborne, and the countryside surrounding the village was the location of Gilbert White's pioneering observations on natural history. Hampshire's county flower is the Dog Rose. Hampshire has a milder climate than most areas of the British Isles, being in the far south with the climate stabilising effect of the sea, but protected against the more extreme weather of the Atlantic coast. Hampshire has a higher average annual temperature than the UK average at 9.8 to 12 °C (49.6 to 53.6 °F), average rainfall at 640–1,060 millimetres (25–42 in) per year, and holds higher than average sunshine totals of around 1,750 hours of sunshine per year. There is a separate list of hills with Hampshire's highest and most notable hills. Hampshire's county town is Winchester, a historic city that was once the capital of the ancient kingdom of Wessex and of England until the Norman conquest of England. 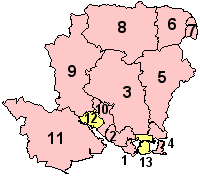 The port cities of Southampton and Portsmouth were split off as independent unitary authorities in 1997, although they are still included in Hampshire for ceremonial purposes. Fareham, Gosport and Havant have grown into a conurbation that stretches along the coast between the two main cities. The three cities are all university cities, Southampton being home to the University of Southampton and Southampton Solent University (formerly Southampton Institute), Portsmouth to the University of Portsmouth, and Winchester to the University of Winchester (formerly known as University College Winchester; King Alfred's College).The northeast of the county houses the Blackwater Valley conurbation, which includes the towns of Farnborough, Aldershot, Blackwater and Yateley and borders both Berkshire and Surrey. Hampshire lies outside the green belt area of restricted development around London, but has good railway and motorway links to the capital, and in common with the rest of the south-east has seen the growth of dormitory towns since the 1960s. Basingstoke, in the northern part of the county, has grown from a country town into a business and financial centre. Aldershot, Portsmouth, and Farnborough have strong military associations with the Army, Royal Navy, and Royal Air Force respectively. The county also includes several market towns: Alton, Andover, Bishop's Waltham, Lymington, New Milton, Petersfield, Ringwood, Romsey and Whitchurch. For the complete list of settlements see List of places in Hampshire and List of settlements in Hampshire by population. Due to Hampshire's long association with pigs and boars, natives of the county have been known as Hampshire hogs since the 18th century. Hampshire has literary connections, being the birthplace of authors including Jane Austen, and Charles Dickens, and the residence of others, such as Charles Kingsley. Austen lived most of her life in Hampshire, where her father was rector of Steventon, Hampshire, and wrote all of her novels in the county. Hampshire also has many visual art connections, claiming the painter John Everett Millais as a native, and the cities and countryside have been the subject of paintings by L. S. Lowry and J. M. W. Turner. Selborne was the home of Gilbert White; his house is now a museum, which also includes The Oates Collection, dedicated to the explorer Lawrence Oates. Hampshire is the home of many orchestras, bands, and groups. Musician Laura Marling hails originally from Hampshire. The Hampshire County Youth Choir is based in Winchester, and has had successful tours of Canada and Italy in recent years. The Hampshire County Youth Orchestra (with its associated chamber orchestra and string orchestra) is based at Thornden Hall. The game of cricket was largely developed in south-east England, with one of the first teams forming at Hambledon in 1750, with the Hambledon Club creating many of cricket's early rules. Hampshire County Cricket Club today is a successful first-class team, captained by James Adams. The main county ground is the Rose Bowl in West End, which has hosted several one day internationals and which, following redevelopment, hosted its first test match in 2011. Hampshire have also been captained by former Australian leg-spinner Shane Warne. Hampshire's relatively safe waters have allowed the county to develop as one of the busiest sailing areas in the country, with many yacht clubs and several manufacturers on the Solent. The sport of windsurfing was invented at Hayling Island, which is to the south east of the county. 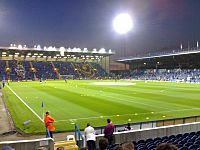 Hampshire has several association football teams, including Premier League side Southampton F.C., League Two side Portsmouth F.C. and Conference Premier sides Aldershot Town F.C. and Eastleigh F.C., . Portsmouth F.C. and Southampton F.C. have traditionally been fierce rivals. Portsmouth won the FA Cup in 1939 and 2008 and Football League title twice, in 1949 and 1950, but have spent much of the last 50 years outside the top division, including three seasons in the Fourth Division, which they are currently competing in (the lowest division in senior football). Southampton, meanwhile, won the FA Cup in 1976, reached 3 other finals (1900, 1902, and 2003) and spent 27 unbroken years in England's top division between 1978 and 2005. Aldershot F.C. became members of the Football League in 1932 but never progressed beyond the Third Division, and on 25 March 1992 went into liquidation and were forced to resign from the league. A new football club, Aldershot Town F.C. was formed almost immediately, and started life in Division 3 of the Isthmian League. In 2008 Aldershot Town were crowned the Conference Premier champions and were promoted into the Football League, however they lost their Football League status after the 2012–13 season which saw them finish bottom of the football league. Hampshire also has a number of Non League football teams. Basingstoke Town, Farnborough and Havant & Waterlooville play in the Conference South. Bashley Gosport and AFC Totton play in the Southern Football League Premier Division and Sholing F.C. and Winchester City F.C. play in the Southern Football League Division One South and West. Thruxton Circuit, in the north of the county, is Hampshire's premier motor racing circuit. The National Motor Museum is located in the New Forest adjacent to Beaulieu Palace House. The Farnborough Airshow is a popular international event, held biennially. Southampton Airport, with an accompanying main line railway station, is an international airport situated in the Borough of Eastleigh, close to Swaythling in the city of Southampton. Cross-channel and cross-Solent ferries link the county to the Isle of Wight, the Channel Islands and continental Europe. The South Western Main Line (operated by South West Trains) railway from London to Weymouth runs through Winchester and Southampton, and the Wessex Main Line from Bristol to Portsmouth also runs through the county as does the Portsmouth Direct Line. The M3 motorway connects the county to London. The construction of the Twyford Down cutting near Winchester caused major controversy by cutting through a series of ancient trackways (the Dongas) and other features of archaeological significance. The M27 motorway serves a bypass for the major conurbations and as a link to other settlements on the south coast. Other important roads include the A27, A3, A31, A34, A36 and A303. Hampshire formerly had several canals, but most of these have been abandoned and their routes built over. The Basingstoke Canal has been extensively restored, and is now navigable for most of its route, but the Salisbury and Southampton Canal, Andover Canal and Portsmouth and Arundel Canal have all disappeared. Restoration of the Itchen Navigation, linking Southampton and Winchester, primarily as a wildlife corridor, began in 2008. Hampshire Facts for Kids. Kiddle Encyclopedia.